In this fifth part, we will add the communication layer to our real-world cloud app that we are developing in this series from start to finish. 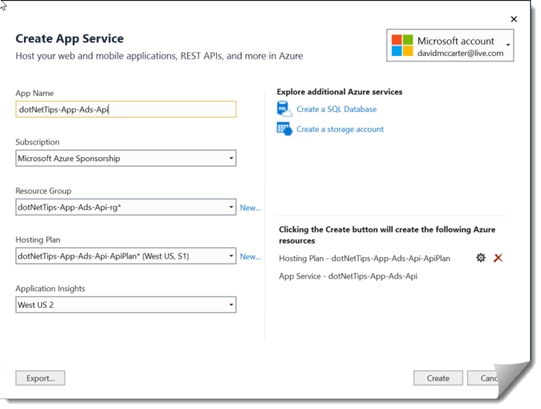 In the fourth article in this series, I talked about and showed how to code the business layer for this cloud solution that included an Azure Service Bus Queue and an Azure Function. In this article, I’m going to add on top of that the communications layer, so apps and other services can get to the ad data stored in Cosmos DB. If you remember way back when I started writing this series of articles, my goal was to use all the latest and greatest features of Azure. Well, like most projects, I am quickly approaching a deadline to get this done before I go out of the country to present it at conferences starting in April. Since I’m only one person and I have a limited number of hours I can spend on the project before then, I need to go to my backup plan. My intent was to use a Service Fabric application not only since it is new to the list of Azure offerings, but I really wanted to use the caching that a stateful service offers. In my conference sessions and books, I talk about how important it is to cache data on the server and client side to improve the perceived speed of the application. 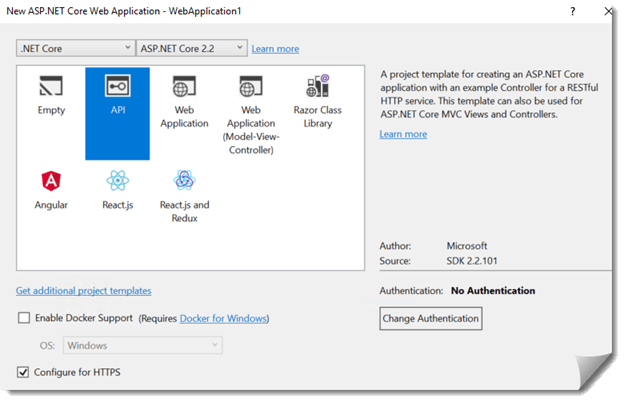 After struggling with understanding how it works and the issues with it running in Azure, I decided to go back to what I know and that is to use an App Service that uses Web API. Web API has been around for a long time and is easy to create and publish to Azure. Before I went to this backup plan, I did watch a Pluralsight course on Service Fabric a few times, read a lot on the web and even tapped some of my Azure MVP friends. Unfortunately, I couldn’t get the issues solved in a timely manner. I do hope that the Visual Studio and ASP.NET teams at Microsoft will make this process simpler in the future since I am not a DevOps expert. So, let’s get started. I chose API and checked Configure for HTTPS. I don’t see any reason why HTTP wouldn’t work, but the new Microsoft guideline is to make all web traffic HTTPS. Plus, this allows me to possibly surface data that needs HTTPS in the future. 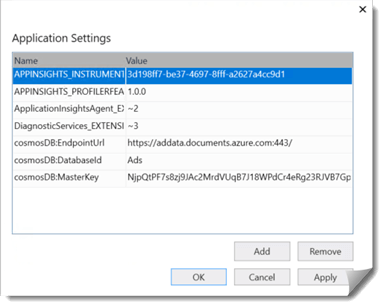 To communicate with the Cosmos DB database via the dotNetTips.App.Ads.DataAccess assembly (discussed in a previous article), I added a new folder to the project called Repositories and then created a new class file called LiveAdsRepository. My intent with this repository is to return data only (no Post, Delete etc.). I will add other repositories when I need them for the Blazor app in the next article. The GetLiveAds method will return ad data for the requested App. The default value for App is All, so all ads, that are enabled to run, will be returned which is not an issue right now since I have only defined one App so far. The Get method above takes the App value from the query string, calls the repository and returns the ads an IEnumerable<Ad> collection. If no ads were returned, then I set the http status code to NoContent. Now let’s publish it. Since Web API has been around for a while now, publishing is easy. To get started, simply right-click on the project and select Publish. Once on the Publish screen select New Profile, since we have not created the app service in Azure yet. I set the App Name to dotNetTips-App-Ads-Api, selected my subscription and then created a new resource group and hosting plan. I also, configured Application Insights as shown above. After selecting Create, the app will be built and then published to Azure for the first time. At this point, it won’t connect to Cosmos DB, so let’s do that next. 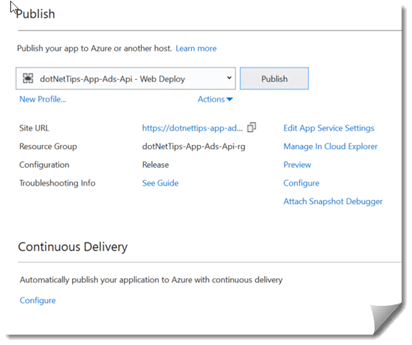 Publish again, and the newly configured application settings will be published to Azure. Now, the app can be tested locally. I wish that when adding new configuration values, Visual Studio would also add the values to the appsettings.json file, but it doesn’t, so you will need to manually. If in the future I need a stateful service, then I will learn Service Fabric since it would be trivial to add what I showed you today. Utility Dev App: http://bit.ly/DevUtility. This is the app I will be connecting to this cloud app at the end of this article series. I hope you will check it out! In the next article, I will be coding the user experience layer using ASP.NET and Blazor, so check back here soon. Please make any comments below.